From Airport to Venice, with my Experience, I know the best! From Airport to Venice, how to get there? Hi there! I'll tell you about how to go from the airport to Venice! Venice Italy uses two airports nearby. Named: Treviso Airport and Marco Polo Airport. Which airport is yours? You didn't know that, right? Or perhaps somebody informed you about how to get to Venice from the airport! Well, you're in the right place... Welcome. If you fly with a low-budget airline you probably will arrive at Treviso Airport. Please scroll down or read how to transfer from Treviso Airport to Venice. Questions on my site are about how to get from Mestre to Venice. Visitors have their hotel in Mestre. A hotel outside Venice is not a bad idea, because the transport connections to Venice are good. But, we are here to learn how to get from the airport to Venice. So let's continue with Marco Polo Airport! Marco Polo Airport is used by the major airlines. Big chance your flight will arrive here. The airport is 6 miles from Venice. From airport to Venice you can take the Alilaguna line. This ferry you can use between Marco Polo Airport and Venice. From the Airport to Venice by Alilaguna boat is fun! 10 minutes walk from the terminal to the pier. Direction signs will show you the way. The Alilaguna boat instance stops at Lido, near the Rialto Bridge and St. Mark's Square in Venice. Until midnight it is possible to get from the airport to Venice with this service. Please be aware, taking the Alilaguna line can be quite expensive. 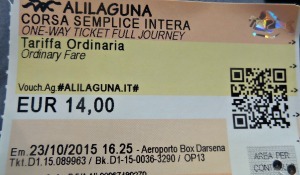 A return ticket on the Alilaguna boat costs € 27, -, a single ticket € 15, -. It takes between 45 and 90 minutes to arrive at most destinations. 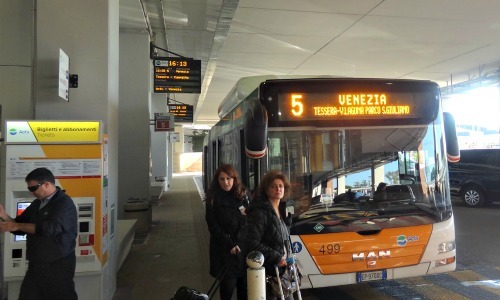 The cheapest way to get the airport to Venice is the bus; shuttle service with ATVO buses. Every 30 minutes they are driving from the airport via Mestre to Piazzale Roma. The journey takes 25 minutes and costs about € 15, - for a return ticket and a one-way ticket € 8,-. The ticket includes large luggage. Another bus option is the cheapest. This option is the Aerobus no. 5. This bus-service is operated by ACTV the public transport carrier around Venice. Pay attention! Taking large suitcases onto the bus is not always aloud. The ticket costs are about € 8. Tip! When you use more than 3 times the Tourist Travel Card you can save on your budget! 1 Ticket to use the vaporetto boat € 7.50 (75 minutes). 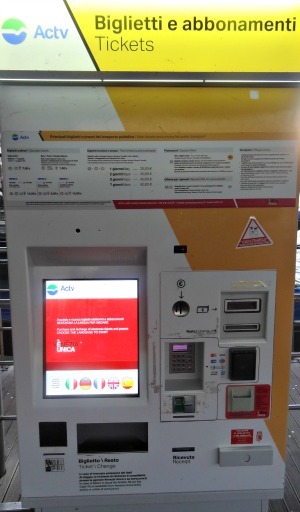 The ticket machine on Treviso Airport, Marco Polo Airport, in Mestre and in Venice! For Alilaguna- and the bus-services from the airport you can not use the Travel Card. The Travel Card gives access to all boats (vaporetto) in and around Venice, the tram to Mestre (vice versa) and most public transport buses of ACTV around Venice. You can also use the travel card on the island of Lido. It is valid for both the bus and the vaporetto boats. On my contact page I often questions about how to get from Airport to Lido; How do you get from airport to the island Lido if you have a hotel over there? I can inform you exactly what to do. What do you do when your hotel is in the city of Mestre. The town is very close to Venice Italy. How do you get from Airport to Mestre? Sure, there are other options to make your transfer from the airport. Like a regular Taxi from Airport to Venice. It costs around € 100, - from Treviso airport. So, that's too expensive. Let's try to make this cheaper via my friends at Cheaptaxis. It's less costly than all the other taxi transfers! And you will have a pre-booked an arranged price. Your taxi will wait for you in front of the terminal. This comfortable ride is a lovely way to arrive in Venice! Last but not least: Tell your own story, your experience or share your personal opinion... Other visitors are thrilled to read the story of real people who have been there. Take your chance and share how to reach Venice from the Airport! Write about it here! Display your own great story how you got from the airport into Venice Italy. Share it! Writing skills? Your comment will appear on a new webpage. Make it as long as you want with photo's and your story. I have shown you how we get from airport to Venice. I have some suggestions, as you will read. Please explore my site more and get even more information about the different topics.